In the last issue, the December Class III price closed at $17.40/cwt and was projected to remain relatively unchanged in January at $17.45/cwt, followed by a nearly 75¢/cwt drop to $16.73/cwt for the month of February. The Class III price for the months of January and February actually closed at $16.77 and $16.88/cwt, respectively. For the month of March, the price is expected to stay stagnant at $16.90/cwt and drop 85¢/cwt in April to $16.05/cwt. Producers should expect February and March mailbox prices to be very similar at around $16.90 to 17.00/cwt. As in previous issues, these feed ingredients were appraised using the software program SESAME™ developed by Dr. St-Pierre at The Ohio State University to price the important nutrients in dairy rations, to estimate break-even prices of all commodities traded in Ohio, and to identify feedstuffs that currently are significantly underpriced as of March 26, 2017. Price estimates of net energy lactation (NEL, $/Mcal), metabolizable protein (MP, $/lb; MP is the sum of the digestible microbial protein and digestible rumen-undegradable protein of a feed), non-effective NDF (ne-NDF, $/lb), and effective NDF (e-NDF, $/lb) are reported in Table 1. Nutrient prices continue to remain relatively unchanged as they have been for the past two years. For MP, its current price ($0.44/lb) has risen slightly from January’s issue ($0.38/lb) as a result of the recent surge in animal byproducts. Soybean prices have also risen slightly; however, the MP price is still similar to the 5 year average ($0.43/lb). The current price will likely decrease after the planting season is over because of the surge in seed sales and the projected 5 million more acres of soybeans to be planted in 2017 compared to last year according to the USDA. The South American harvest ongoing will drive protein price down even further as they are currently on track for a record year. The cost of NEL decreased nearly 2¢/lb to 7.5¢/lb, while the price of e-NDF and ne-NDF are nearly identical to last month at 5¢/lb and -4¢/lb (i.e., feeds with a significant content of non-effective NDF are priced at a discount), respectively. 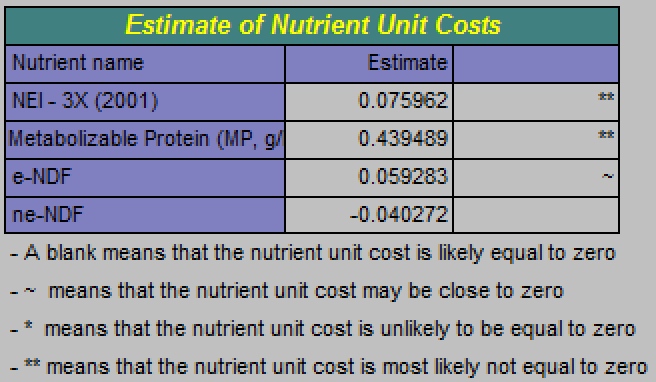 To estimate the cost of production at these nutrient levels, I used the Cow-Jones Index with cows milking 70 lb/day or 85 lb/day at 3.7% fat and 3.1% protein. For January’s issue, the average income over nutrient costs (IONC) was estimated at $11.57/cwt for a cow milking 70 lb/day and $11.94/cwt for a cow milking 85 lb/day. For March, the IONC for our 70 lb/day and 85 lb/day cows are slightly lower at an estimated $10.80/cwt and $11.18/cwt, but this should still be profitable. Table 1. Prices of dairy nutrients for Ohio dairy farms, March 26, 2017. Results of the Sesame analysis for central Ohio on March 26, 2017 are presented in Table 2. 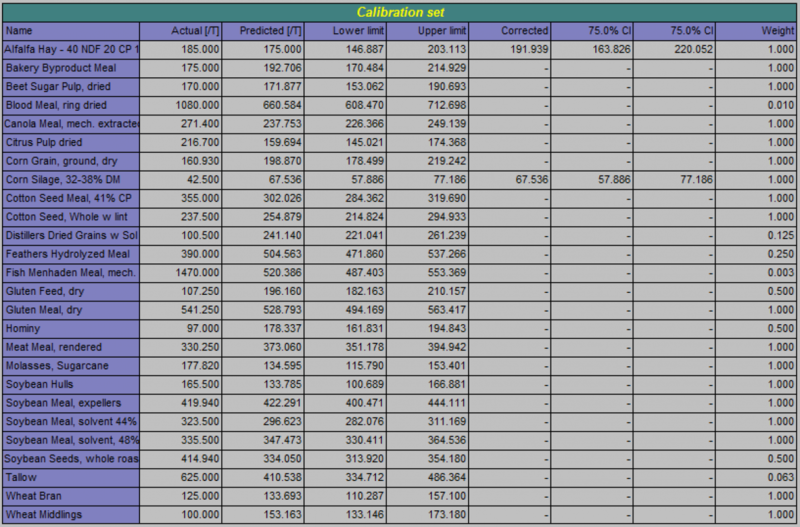 Detailed results for all 26 feed commodities are reported. The lower and upper limits mark the 75% confidence range for the predicted (break-even) prices. Feeds in the “Appraisal Set” were those for which we didn’t have a price. One must remember that Sesame compares all commodities at one specific point in time. Thus, the results do not imply that the bargain feeds are cheap on a historical basis. Table 2. Actual, breakeven (predicted) and 75% confidence limits of 26 feed commodities used on Ohio dairy farms, March 26, 2017. For convenience, Table 3 summarizes the economic classification of feeds according to their outcome in the Sesame analysis. Feedstuffs that have gone up in price, or in other words moved a column to the right since the last issue, are red. Conversely, feedstuffs that have moved to the left (i.e., decreased in price) are green. Table 3. Partitioning of feedstuffs, Ohio, March 26, 2017. As coined by Dr. St-Pierre, I must remind the readers that these results do not mean that you can formulate a balanced diet using only feeds in the “bargains” column. Feeds in the “bargains” column offer savings opportunity and their usage should be maximized within the limits of a properly balanced diet. In addition, prices within a commodity type can vary considerably because of quality differences, as well as non-nutritional value added by some suppliers in the form of nutritional services, blending, terms of credit, etc. Also, there are reasons that a feed might be a very good fit in your feeding program while not appearing in the “bargains” column. For example, your nutritionist might be using some molasses in your rations for reasons other than its NEL and MP contents. 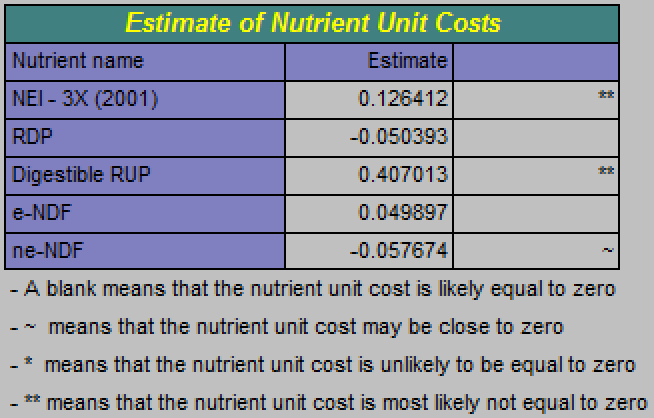 For those of you who use the 5-nutrient group values (i.e., replace metabolizable protein by rumen degradable protein and digestible rumen undegradable protein), see Table 4. Table 4. Prices of dairy nutrients using the 5-nutrient solution for Ohio dairy farms, March 26, 2017.